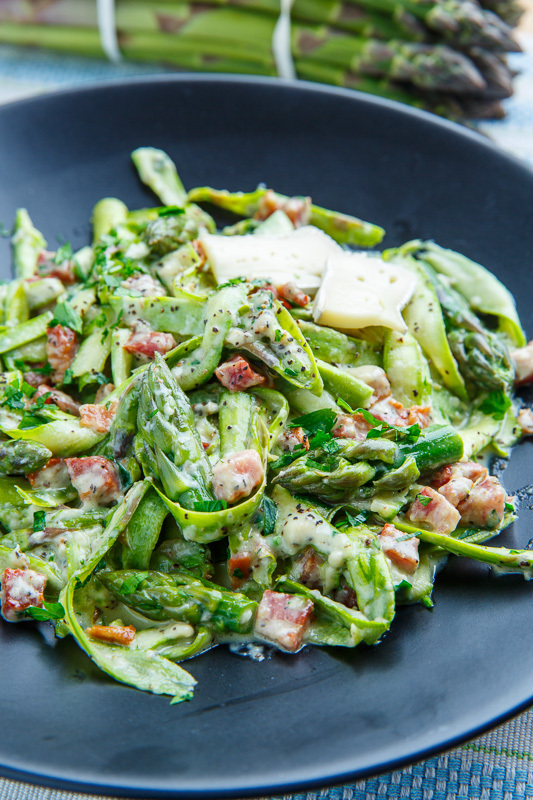 Asparagus “noodles” in a creamy egg and parmesan sauce with pancetta and plenty of fresh cracked black pepper; A lighter summery take on carbonara pasta with asparagus noodles! I have been having fun using vegetables as “noodles”, like zucchini noodles (aka zoodles), and now that the asparagus is here I could not resist slicing up some asparagus to make asparagus noodles! 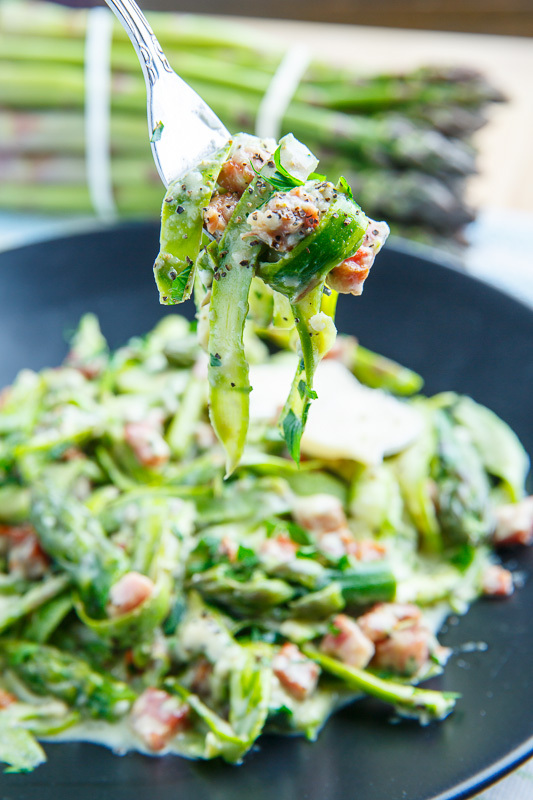 Slicing the asparagus into noodles can be done with a vegetable peeler, a mandoline or just with a knife and although it takes a bit of effort it’s definitely worth it! The fist “pasta” that I decided to make with asparagus noodles was a carbonara pasta which is a nice and simple pasta with a creamy egg, bacon/pancetta, parmesan and black pepper sauce. 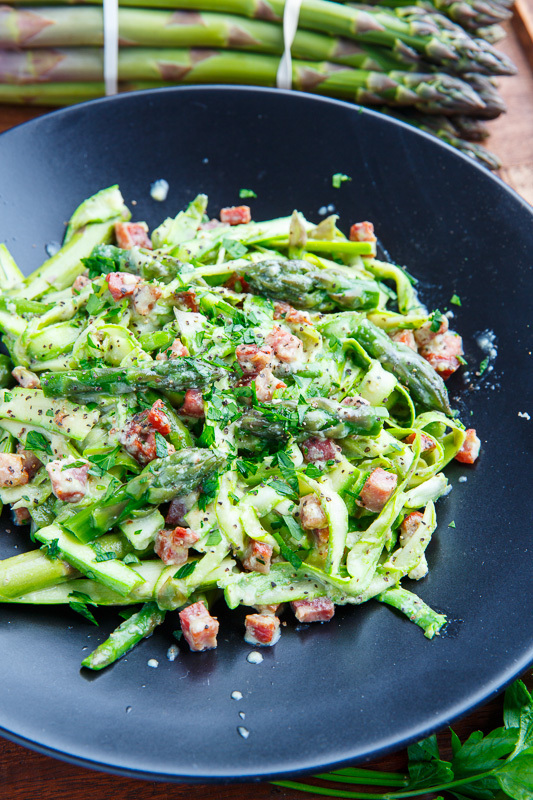 Once you have the asparagus noodles sliced this recipe takes very little time to make where you just need to cook the asparagus tips and the pancetta, add the asparagus noodles and quickly cook before adding the sauce and mixing everything together. (The eggs in the sauce are cooked by the residual heat in the pan without turning into scrambled eggs.) 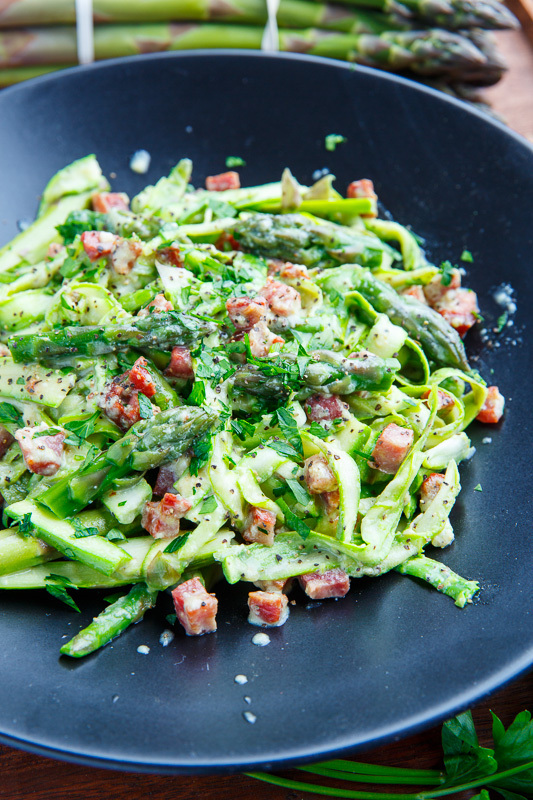 This asparagus noodle carbonara is so nice and light and summery good! I really enjoyed the aldente asparagus noodles and they work amazingly well as a lighter substitute for regular pasta noodle! I can’t wait to experiment with asparagus noodles some more! Don’t like the idea of using egg in a sauce like this? Try replacing them with cream or better yet, creamy melted brie! <- Even if you like the egg sauce, you so have to try it with the brie! Steam the asparagus tips and set aside, reserving some of the cooking water. Meanwhile, cook the pancetta in a pan over medium heat, pour off all but a tablespoon of the grease from the pan, add the garlic, cook for 30 second. 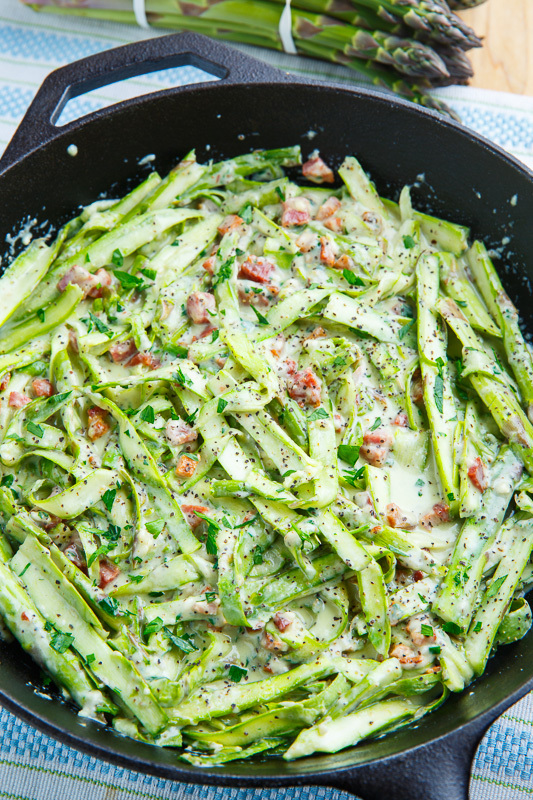 Remove from heat, mix in the mixture of the eggs, parmesan, pepper, salt and parsley and enough of the reserved cooking water to make a creamy sauce into the asparagus noodles and tips. Option: Replace the pancetta with bacon. Option: Replace the 2 eggs with 1/2 cup heavy cream or 8 ounces peeled brie. I would gladly have a huge helping of this for dinner!!! SOOO good! 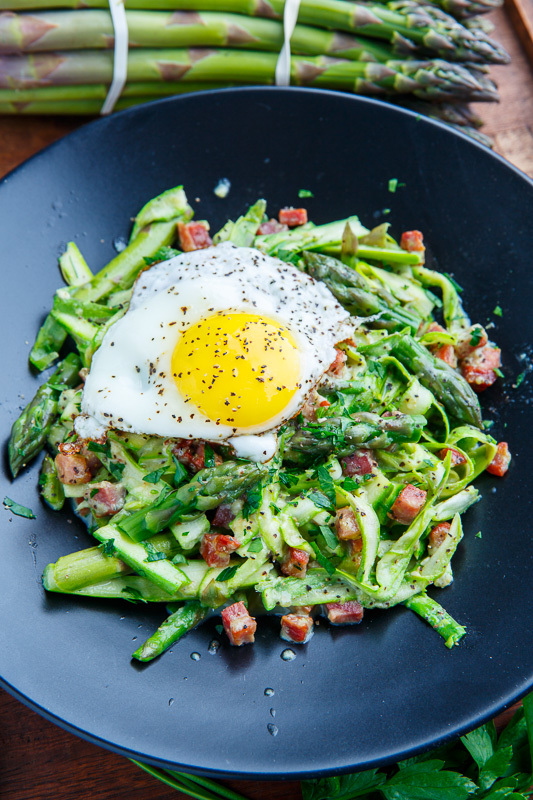 I love the asparagus noodles! 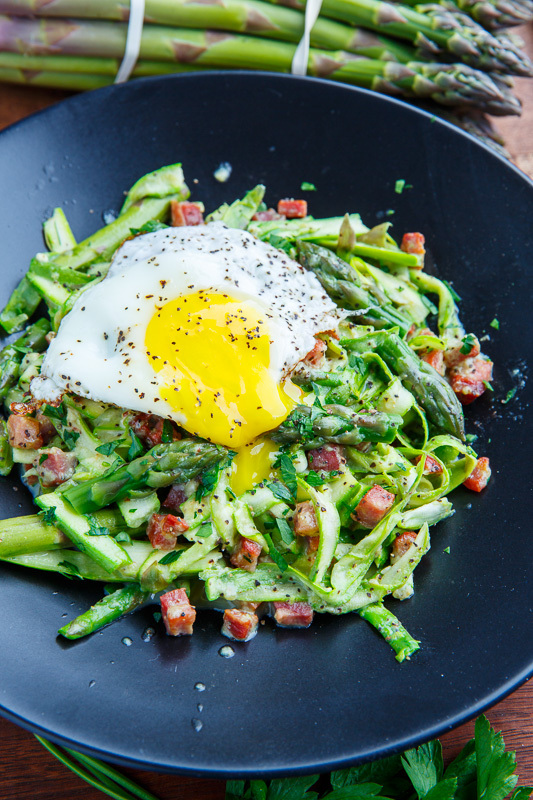 Asparagus noodles need to happen in my kitchen now! Brilliant idea! This was really delicious. I cut down the amount of asparagus but found that the asparagus really shrinks when it's cut like this so next time I'll use more. (Note to self: don't mess with Kevin's measurements! LOL!) I used the cream. Very fresh tasting! I loved it. Thanks, Kevin! C-horse: I'm glad you liked it! Vanessa Johnson: I'm glad you enjoyed it!